LOS ANGELES — Like many people who grew up in the 1970s, I came of age with AM radio. Everybody I knew — the black kids on my block, the white and Asian kids at my junior high school — followed the Top 40 and discussed the merits of the newest releases by Elton John and Eddie Kendricks. […]At home, the kitchen-counter radio was always tuned to KABC. It aired restaurant shows, call-in psychologist shows, news shows, all featuring sophisticated discussions of things I had only vague ideas about. My mother listened while she ironed or cooked or sat at the table paying bills. The radio was her company, and because I admired her (but didn’t quite know how to talk to her), it became mine, too. Read this full Op Ed piece at the New York Times. This entry was posted in AM, News and tagged AM Radio, Art Bell, Coast to Coast AM, NY Times on November 4, 2018 by Thomas. Every so often our sun emits an invisible burst of energy. This energy ripples through space as electromagnetic waves and then crashes into planets and meteors and space debris and one another, causing a great cacophony above and around us. A cacophony that was inaudible, until Ruby Payne-Scott entered a laboratory. In the 1940s, Payne-Scott helped lay the foundation for a new field of science called radio astronomy. Her work led to the discovery of deep-space phenomena like black holes and pulsars and later helped astronauts understand how solar storms disrupt weather in space and electrical grids on Earth. Yet as a married woman she was denied equal employment status and compensation. She challenged the scientific establishment in her native Australia and fought for the rights of women in the workplace, but ultimately left science to raise her children full time. Continue reading the full article at the NY Times. This entry was posted in News and tagged Howard Bailen, NY Times, Radio Astronomy, Ruby Payne-Scott on September 4, 2018 by Thomas. SEATTLE — A knowledge of geography is essential if you are running a tiny, 100-watt radio station. Hills are bad, for example, as are tall buildings. Salt water, though, which lies at this city’s doorstep, can boost a radio signal for miles, like a skipped rock. For a low-power FM radio station, anything measurable in miles is good. But on a recent Thursday night, one station, KBFG, was struggling to even get on the air. The station’s signal, audible since November in an area measurable in square blocks, had flatlined. The Ballard High School basketball team was about to take the court and the live play-by-play was in doubt. “We’re bootstrapping it,” said Eric Muhs, a physics and astronomy teacher. Headphones were slung around his neck, and a mop of unruly gray hair came further undone as he leaned into his laptop trying to fix a software glitch. But Mr. Muhs, 60, one of KBFG’s founders, admitted that the stakes for failure were relatively low. “Almost nobody knows that we exist,” he said. Low-power nonprofit FM stations are the still, small voices of media. They whisper out from basements and attics, and from miniscule studios and on-the-fly live broadcasts like KBFG’s. They have traditionally been rural and often run by churches; many date to the early 2000s, when the first surge of federal licenses were issued. This entry was posted in FM, News and tagged Community Radio, FM Radio, LPFM, Mike (K8RAT), NY Times on January 8, 2018 by Thomas. Many thanks to my buddy, David Goren, who recently discovered that the New York Times Store is now selling fully-restored antique radios. Pricing is not for the faint of heart–at time of posting, prices ranged from $395 to $23,000 US. 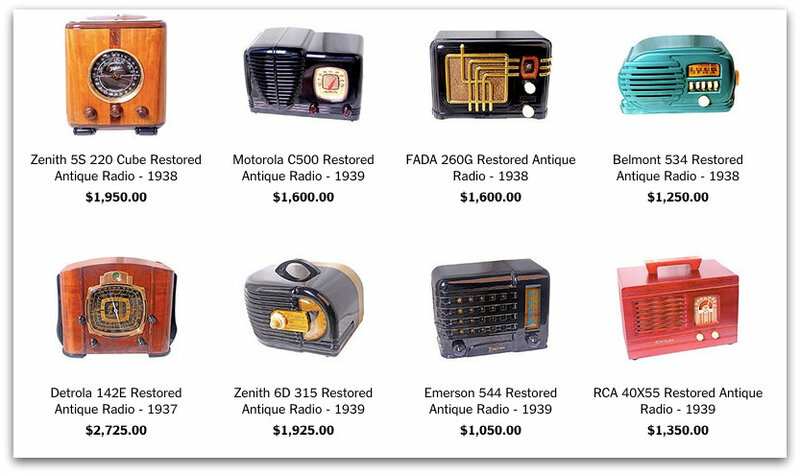 Each radio is beautifully presented, with a full description, and carries a one year restoration warranty. For an additional $95, many models can be modified with an AUX in audio jack. While these radios are well outside my meager vintage radio budget, I must say that I’ve thoroughly enjoyed looking at the photos and reading the descriptions. Click here to view on the NY Times Store. This entry was posted in AM, News, Nostalgia, Radio History, Radios and tagged Antique Radio, antique radios, New York Times Antique Radios, NY Times, NY Times Antique Radios, NY Times Store on September 4, 2015 by Thomas.